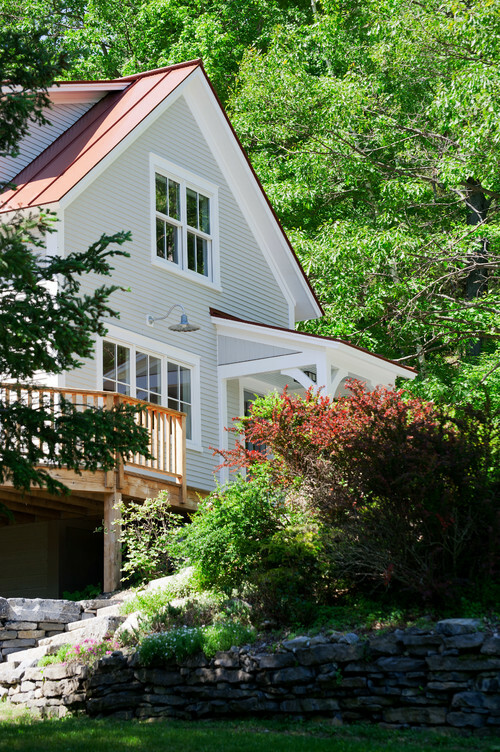 A new Vermont farmhouse is built on an old foundation to create a truly unique home. 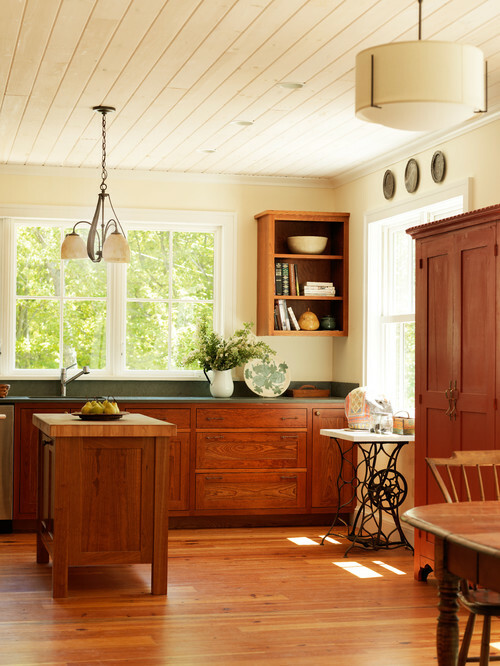 Salvaged pieces from the old home are incorporated into the new one throughout. Metal roofs are a classic element of an older farmhouse. My own house has a partial metal roof that I love. 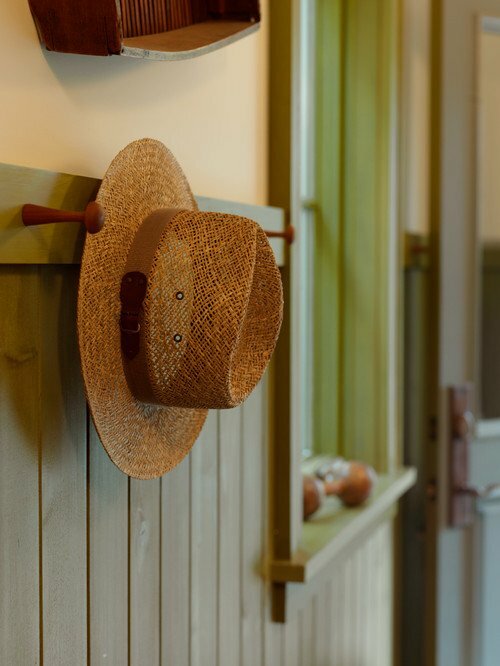 Inside, you’ll find plenty of Vermont farmhouse elements like chair peg rails and straw hats. 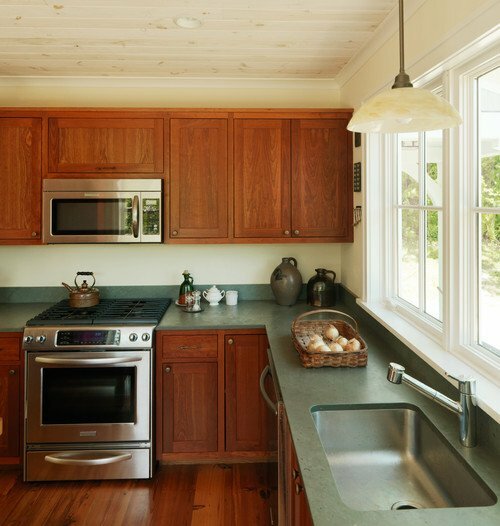 The kitchen is simple and beautiful with wide plank pine floors and a wood slat ceiling. The kitchen has all the modern conveniences. 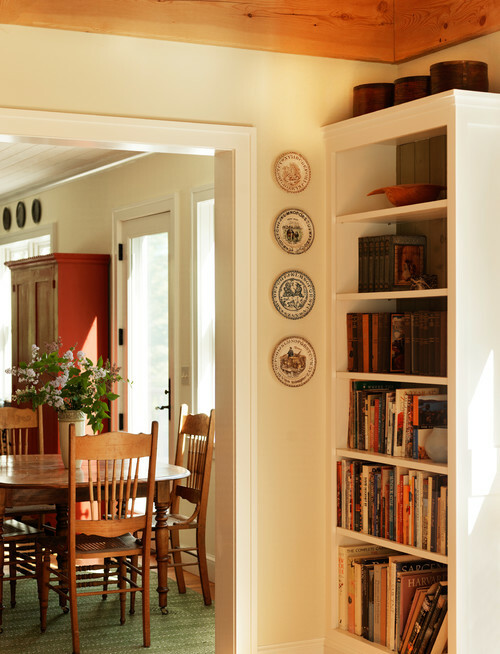 Built-in bookcases infuse farmhouse charm into the new energy-efficient home. 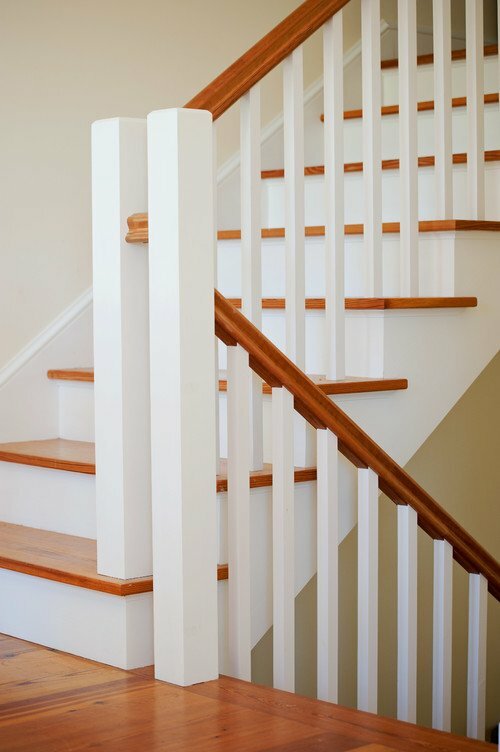 I’ve always loved two-toned staircases and this one doesn’t disappoint. 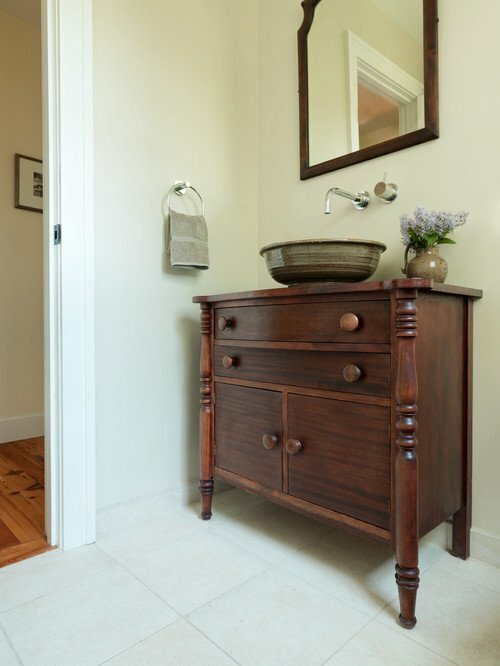 A vintage chest serves as a vanity in the powder room. This is something I’d like to do in my downstairs bathroom. 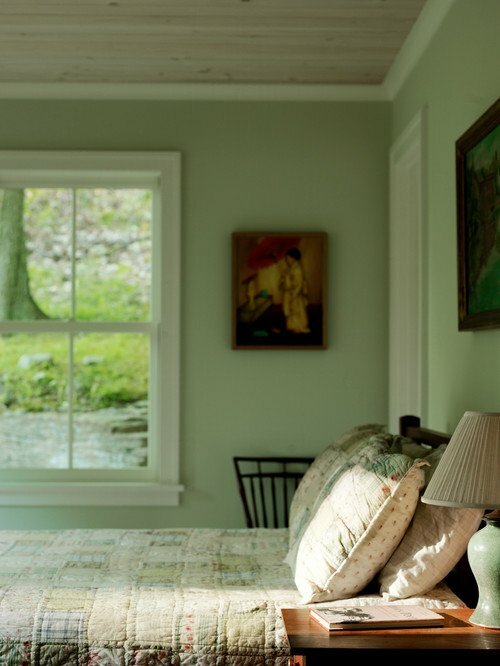 The Vermont farmhouse has simple bedrooms that are peaceful and serene. A soft quilt adorns the bed. 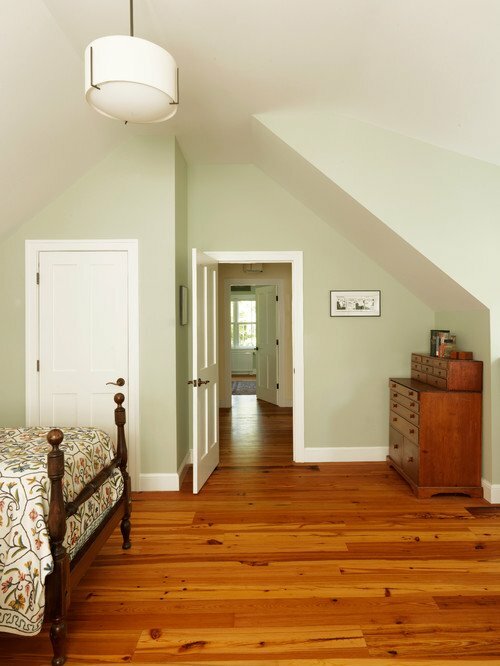 Here you can see the gorgeous pine floors throughout the Vermont farmhouse. 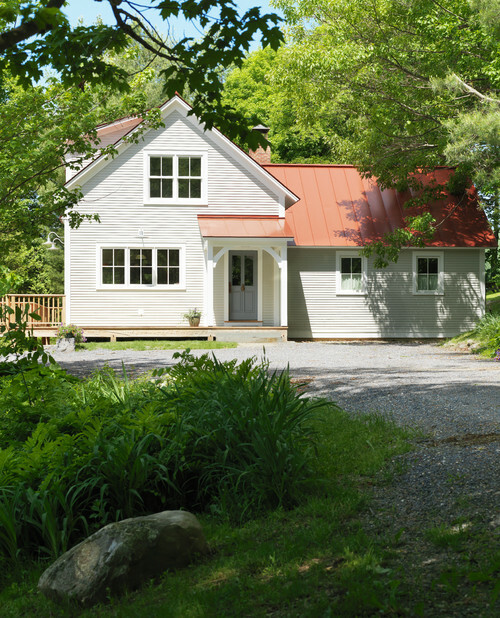 You can see more of this new Vermont farmhouse built by Silver Maple Construction on an old foundation over at Houzz. 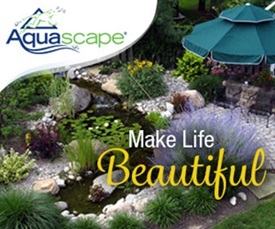 This must have reminded you of your own beautiful home. The kitchen layout with the multiple windows over the sink and the large built in, for example. However, your home shines with personality where this one lacks your special touches. My daughter installed an old dresser as a vanity in her first floor powder room, and since she’s a potter, she made her own sink bowl – a one of a kind – and along with an old trunk, a braided rug and an antique mirror, it is the most interesting room in her house. Your daughter’s bathroom sounds amazing! 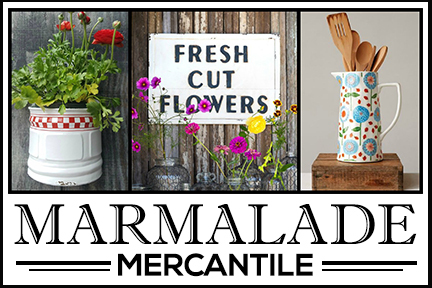 I can only imagine what her sink looks like after seeing her pottery. i love braided rugs. Been thinking of adding one in my bedroom. 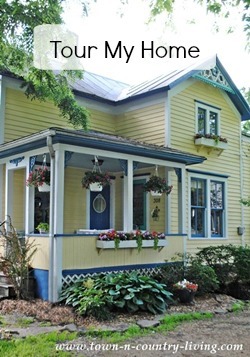 Thanks for your kind words about my home! 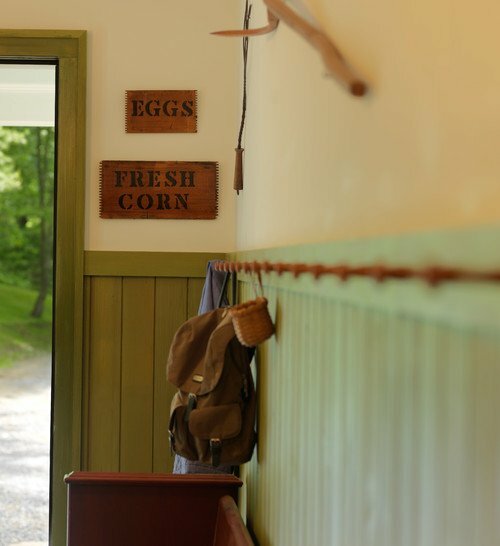 I’d love to get my hands on this Vermont house. My cousin is an architect in Vermont and he designed a beautiful energy-efficient home a few years ago. I need to go back to Vermont. It’s so beautiful. This is a lovely home but lacks some of the personality you have added to yours. 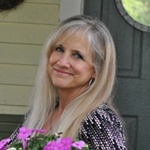 I love your eat-in kitchen and your stairs and entry and of course now your beautiful back yard. Thanks for the tour. I just came back from spending the weekend in a cottage in Vermont! It is my favorite state, and where we always go to each Fall to celebrate our anniversary. I have found that the craftsmanship of even new construction is far better than what I have seen in other places I have traveled to. And so many people are artistic there that it’s a feast for the eyes to see how people fill there homes with unusual things. And of course, God’s artwork there in the mountains and streams is even better! This house was cute. Yours is cuter!